408 pages | 25 B/W Illus. Play is a crucial component in the development of all children. In this fully updated and revised edition of his classic playwork text, Bob Hughes explores the complexities of children’s play, its meaning and purpose, and argues that adult-free play is essential for the psychological well-being of the child. The book is divided into fourteen chapters that together examine the fundamentals of evolutionary play. Firstly, Hughes examines the very earliest ideas of playwork and its impact on brain growth and organization today. He then goes on to explore and explain the key theoretical concepts underlying playwork. These include discussions on free play and creating suitable play environments alongside more thorny issues such as safety and consultation. Finally, the book offers up some of Hughes’ most recent research that reveals how his approach to play and playwork in global society has continued to evolve throughout his career to meet new challenges and needs. Throughout this book, Hughes has included his fellow practitioner Mick Conway’s vivid observations of children at play to bring the facts and arguments in the text to life. 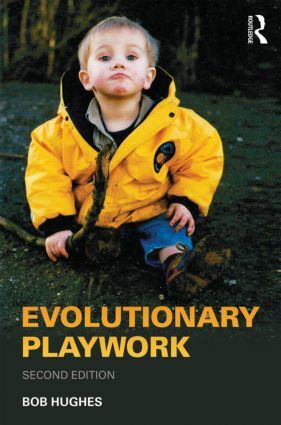 This revised edition reflects important recent advances in our understanding of the evolutionary history of play and its impact on the development of the brain, of the role play in the development of resilience and of the impact of play deprivation. Evolutionary Playwork is still the only book to combine the reality of playwork practice with the fundamentals of evolutionary and developmental psychology, and it is still essential reading for all playwork students, practitioners and researchers. Bob Hughes has been a theoretical and applied playworker for nearly forty years. He is widely published on the subject of Play and Playwork and was the first Editor of the International Play Journal. He has been the National Coordinator of PlayEducation, an independent playwork agency providing training and research services, since 1982.